Stevenot recounted his campaign strategy to unseat incumbent Congresswoman Jean Schmidt (OH-2) in the 2012 Republican primary. Schmidt represented a southern Ohio district which included Clermont County – aka Ted’s turf and home of the Clermont County Tea Party. According to Stevenot, “80% of US congressional districts are controlled by a single party.” Gerrymandered or irregularly drawn districts are designed to protect incumbents or parties and are usually considered “safe” districts. Rewind to 2009 when Stevenot was “just a guy” sitting on his couch “shouting at the TV” asking himself what he could do. Clermont County Tea Party held their first meeting in December 2009. Ted’s primary goal – grow the group. He met Rick Herron who advocated the importance of central committee, which Stevenot describes as “the inside baseball…the secret”. How many people get to ballot and don’t like any of the candidate choices? Stevenot wanted to break the party stranglehold of crony insiders at the county level by gaining control of the central committee. Stevenot says we need to focus on local races and separate from “cult of personality” D.C. national races. A precinct is an incredibly influential “building block of political power” of approximately 1000 voters. Each precinct elects one representative for county central committee in the primary. Clermont is a single party district with 200 precincts. Putting the math together. How does a “majority” of 7 control 29 positions? Union Township has 42 precincts and previously had 13 elected central committee members. “No one showed up to run” in the other 29 precincts. The township chairman was elected by a majority vote of 7 of 13 members – then appointed 29 central committee members for the remaining open precincts. In 2010, Stevenot found 26 other liberty minded people to engage in “citizen jury duty”. Most ran unopposed – 23 were elected. Stevenot says many central committee members are employees or cronies of the county or state government structure. That puts them in a position to appoint, endorse, and support people they like. A handful of people ran for 200 precinct positions – a fraction of those formed coalitions to control a few positions of power. Central committee can vote to endorse candidates. In single party districts like Clermont County, the candidate who wins the primary wins the general. Only one out of four votes in the primary. In one party districts, it’s all decided in the primary. The much larger voter turnout in November does not really decide the election. Who’s really making decisions about primary candidates? A handful of elected people making endorsements on central committee. In March 2012, most voters were focused on the presidential primary, not local races. Stevenot concludes that we are damaged by our focus on “the shiny object”, i.e. the presidential race. The left is aware of the importance and value of this position. According to Stevenot, 66 to 75% of percent of central committee are teacher’s union members. In the tall weeds….details, details. Union Township’s party reorganization meeting was followed by a countywide reorganization meeting. The party chairman was unopposed. Wearing shorts and sandals, and no prepared speech, Stevenot gave his “liberty lost” speech. He was elected Vice Chairman of the Clermont County Republican Party. Stevenot worked to build coalitions and run candidates against the establishment for county commissioner, prosecutor, including Stevenot for state rep. In November 2011, the central committee voted on candidate endorsements for the March 2012 primary. Congresswoman Jean Schmidt and challenger Brad Wenstrup split the vote, with Schmidt up by one – but not the 60% needed for endorsement. The central committee broke Schmidt’s endorsement, so she was not listed on the Republican sample ballot. Challenger Brad Wenstrup defeated Congresswoman Schmidt in the March primary with 50.16% to Schmidt’s 41.75% – a difference of 2388 votes. It does not take a huge number of votes. 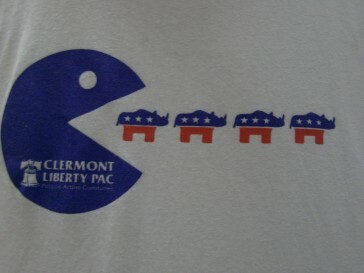 Clermont Liberty PAC was formed. The group made contact with 20,000 voters in 2010. The grassroots volunteers and voters who helped pass Ohio’s Healthcare Freedom Amendment, in every county and with nearly 66% of the vote in 2011, are still out there. “This gives people a voice that don’t currently have voice” and the opportunity to build coalitions with other groups. Stevenot emphasized the importance of precinct and street organizing, building neighborhood coalitions, and repeated face to face contact with voters. Don’t miss the opportunity to hear Rick Herron from Clermont Tea Party present “Project Gavel” at Anderson Tea Party meeting on Tuesday, February 26 at 7 pm. The group meets at Anderson Center, 7850 Five Mile Road (Community Room B, First Floor). Stevenot and Clermont County Tea Party exemplify what focused, principled, liberty minded individuals can accomplish. Please share this story with others using Face book, Twitter, and other social media. This entry was posted in Archives, Local Politics and tagged Anderson Tea Party, Brad Wenstrup, Clermont County Tea Party, Jean Schmidt, Libertas, Precinct organizing, Rick Herron, Ted Stevenot. Bookmark the permalink.